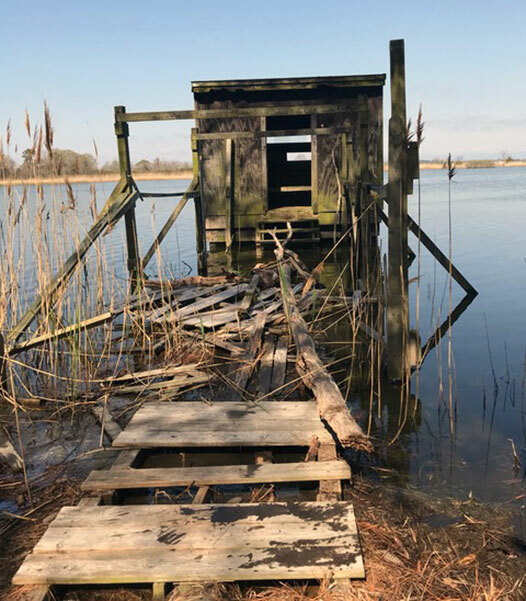 To replace a rotting observation blind that had been unusable for 15+ years, Robert Mayo of Boy Scout Troop 278 on Kent Island raised over $4,000 to design and build a new waterfowl observation platform on Lake Knapp. 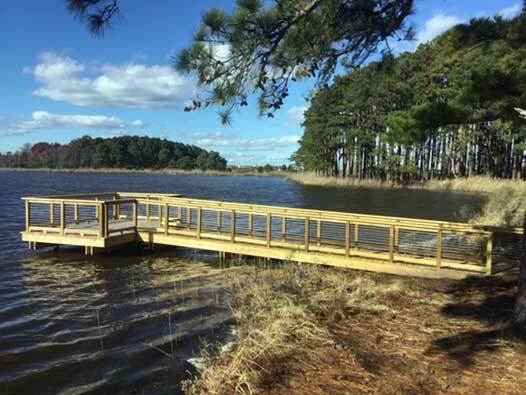 Mayo’s Eagle Scout project gives CBEC visitors a comfortable platform for observing nature. From the platform, you can see ospreys, great blue herons, tri-colored herons, green herons, bald eagles, and marsh wrens; turtles, salamanders, peeper frogs, and water snakes; and an evening’s fabulous sunset. It’s a great spot to visit with a camera, spotting scope, or binoculars, but it’s also a quiet spot for peaceful observation. 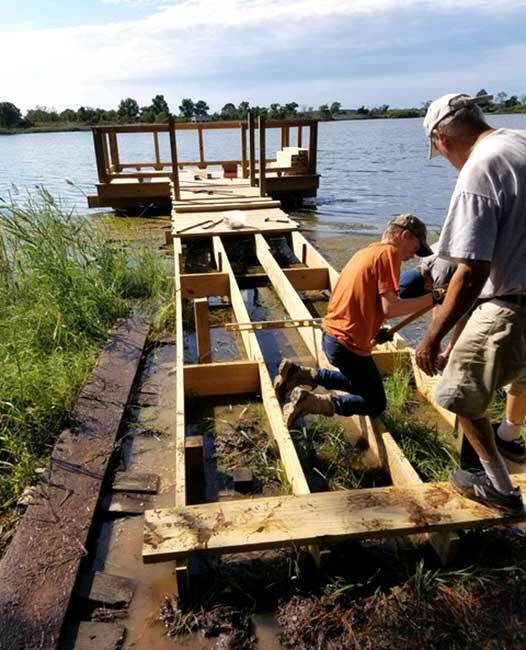 Building the observation platform over Lake Knapp involved some sophisticated engineering and 680 hours of work, beginning with two days to tear down the dilapidated blind and remove the 3,700 pounds of debris. His father and grandfather, along with friends and scouts, helped with the project. After demolishing the old structure, Mayo used a jet pump to jet in 8-foot pilings, needing to pound in the last foot of piling with a sledgehammer. Using marine-grade lumber, Mayo built a 5-foot by 36-foot dock leading to a 15-by-10-foot platform. As a final touch, Mayo placed 1,005 feet of stainless-steel cable running parallel to the deck, providing a clear view from any height. The dilapidated blind that Robert replaced. Beautiful new platform with panoramic views of Lake Knapp. Mayo received his Eagle Scout badge in a ceremony at CBEC on March 24, 2019, with about 80 people in attendance. The project took about a year from conception to final product, beginning in November 2017 and ending in November 2018, just before Mayo’s 18th birthday. A senior at Kent Island High School, Mayo has been accepted to University of Maryland at College Park, UMBC, University of Delaware, University of North Carolina at Wilmington, Virginia Tech, and NC State. He’ll need to make his decision by May 1. He is interested, not surprisingly, in studying civil engineering. The following sponsors, volunteers and donors helped make Mayo’s project a reality: Shawn Cahall at 84 Lumber in Arnold, Md., Kent Island American Legion Post #278; Kent Island Elks Lodge; Grasonville VFW Post #7464; the Mayo Family; Boy Scout Troop #278; Wye Bible Church; Baker and Sons; Chesapeake Hearing Center; Mike and Pamela Brown; Patricia and Ronald Moore; Daniel and Michelle O’Brien; Daniel and Chris Bowman; Marsha Duncan; Kate Ruby; David and Patricia McCarthy; R.B. Baker & Sons, Inc.; Liberty Martin; Jeff Smith; Kathleen Murphy; Judi and Larry Fransen; Adrianna Martin; Craig Patterson; Judy Wink and Vicki Paulas. If interested in completing an Eagle Scout project at CBEC, contact Vicki Paulas at vpaulas@bayrestoration.org or at 410.827.6694.